The statistics on childhood poverty and inequality in our city are so often highlighted. 37% of Birmingham’s children live in poverty. Life expectancy of children born in the poorest neighbourhoods of the city is a whole decade less than those born in the wealthiest. We find ourselves at a moment which demands radical systems-scale intervention to address the challenges we face, responding boldly, proactively, and intentionally to the necessity for change. Any meaningful response to the scale of challenge ahead will need to recognise no that single agent or actor can deliver this future by itself. It requires a movement spanning local authorities, public and private sectors, families, children - ultimately all of us together. 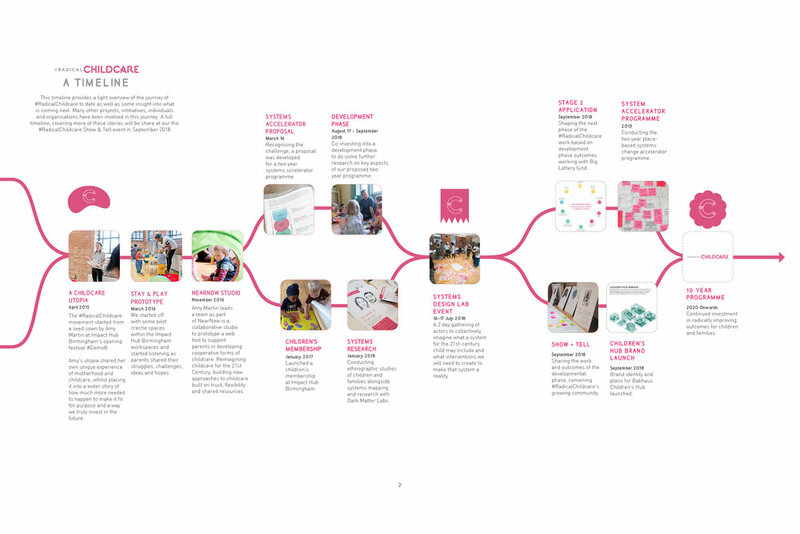 Over the last 3 years the #RadicalChildcare System Lab has done systems, desk-based, ethnographic and participatory research with children and families, culminating in a 2 day public event taking place on 16th - 17th July 2018 to imagine what a system for the 21st century child may include and what interventions will need to be created to make that system a reality. This is all part of a much wider movement which has involved a range of activity which you can find out more about here and at our show and tell event in September 2018. #RadicalChildcare lead Amy Martin's TEDx talk 'Why childcare needs reinvention' also sets the frame perfectly for where some of this work first began. Across 2 days 40 people came together to design ways to radically improve outcomes for children and families. With a range participants, speakers and combined teams from Impact Hub Birmingham and Dark Matter Labs, over 200 ideas were generated drawing on 8 family case studies, stories in the data and a range of tools designed specifically for the lab, which you can find here. The outcomes have now been curated into 10 interdependent investment areas in no particular order that we believe need to be invested in simultaneously to radically transform outcomes for children and families. The ideas are co-created, generated by a range of people, and are the start of a conversation, not an absolute. Want to know more about the reasoning behind these investment areas? Find out more here. A key example of the limitations of this work is that by the very nature of focusing on children and families there is a bias towards specific typologies of ideas. We know inadequate housing or poor nutrition, childhood obesity, children's mental health, the impact of austerity - the list could be almost endless - are are all key indicators for poor health, poor educational outcomes, hospital admissions and ultimately significant future public costs, ideas such as investing in insulation, housing quality, childhood nutrition, or physical activity etc. do not feature heavily currently in the ideas, even though they are crucial, and large system challenges in their own right, however we know we live in a deeply interdependent systemocracy and must not lose sight of the breadth and depth of societal reform that we must embrace to meet the challenges ahead. The investment areas are for everyone to collectively build and add to together - give us feedback. Ultimately we want to dream into the future whilst recognising the difficulties of now, linking local experimentation all the way up to large scale transformation, whilst honouring the deep and difficult work citizens all across the country working at the front line in some of the most challenging times many of us have seen in our lifetimes. This is the start of a global conversation about how we people, places and open movements fit for 21st century children and families. We began this work in Birmingham not only because it’s our home, but because it is an archetype for the future many cities face. Birmingham has had a very tough decade for children’s outcomes and we believe it has incredible potential to reinvent itself as world leading city for children and families. A collaborative project between Impact Hub Birmingham and Dark Matter Laboratories as part of the #RadicalChildcare. The last 12 months of development work, of which the systems lab 2 day event was a key outcome, was proudly supported by Big Lottery Fund.